Dawson loves to get up as high in the house as he can. He loves to sit on our couches right on the edge and "perch". His other favorite spot is on our bed on top of all of our pillows. That is where he sits every morning while I get ready. We have a little routine. He lays there the whole time I'm in the bathroom getting ready and then he knows as soon as he hears me spraying hair spray and then I shut the bathroom door to check myself out in the full view mirror that it's time to go. He hops down and stands in the doorway and waits for me to say "Let's go". He stays in the kitchen/den during the day. He's so funny how he knows us and our routines so well. We are all creatures of habit. First of all, I LOVE the new look. So cute! You have inspired me, I think I need a new header! That is so funny about Dawson! Lucy is exactly like Dawson. She knows we are about to go downstairs right after I turn off the first light in the bathroom & close my closet door. She jumps off the bed & starts getting ready for me to walk out the bedroom door. Although, she gets a little timid because she knows she has to go in her kennell for the day! Stewart just stays out of the way & sleeps downstairs! Thanks for letting me know about the rug. I checked that place out...such fabulous stuff! Bichons are ALL the same! I know this from dog sitting all the Bichons. See my memoir for more info! 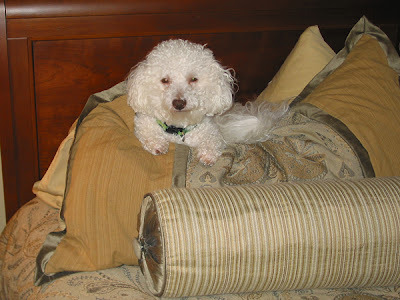 : ) Our Bichon, named Bichon, perches too! She will dig into the pillows, and "nest." She would get up in the window sills and sleep if she could. We secretly think she is a cat in disguise most days!! I love your new title page, too! We are constantly entertained by Bogart and his routines. He builds nests by moving pillows around...then he has to go in about 3 circles around it before he can settle in. I think dogs are so funny.